It’s a longs ways to UP when you’re a seedling. But we’re King of the Garden Lima beans and we have a long ways up to go, so here we go, getting a good start. Two engineers built this structure so there would be up-availability with enough strength to hold heavy, long vines and lots of beans. That is the goal of all of us here. 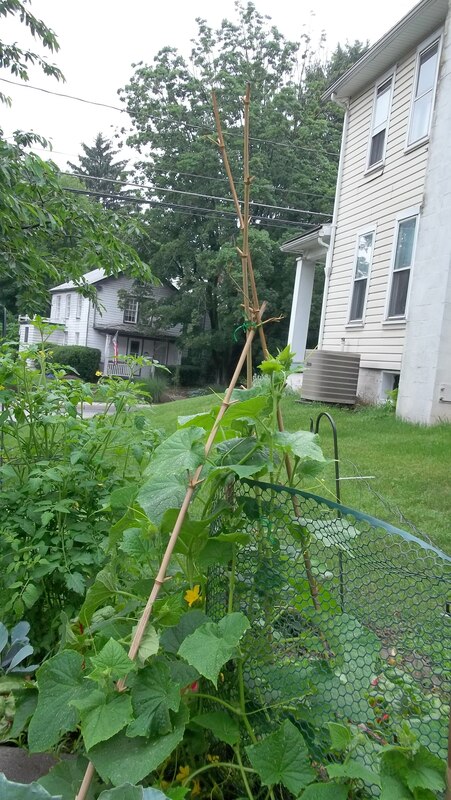 The green beans on the center pole already have 2 flowers. 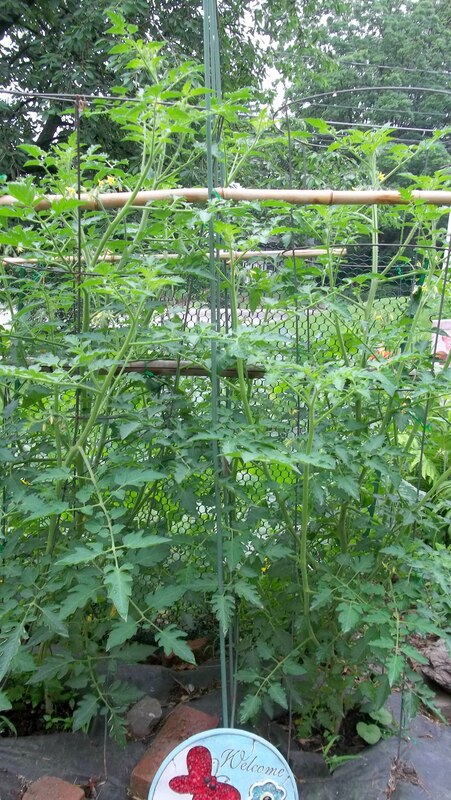 Those engineers also provided tomato cages for our neighbors, yellow plum tomatoes. They have already outgrown the cages, but there is more up-availability there too, with crazy looking bamboo cross poles among trellises. Other neighbors, cucumbers, outgrew the sticks pounded into the ground supporting green mesh. 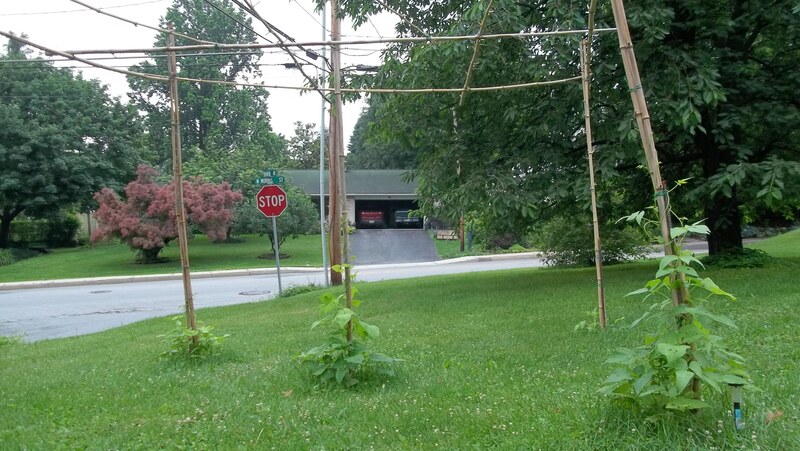 A tee pee of bamboo was needed to keep the cukes from molding from laying on the ground. Cucumber plants will go somewhere, 5′ of somewhere, and since they send out little twiners looking for some place to go, obviously they know that up is better than over. Aggressive growers we all are, and we are the blessings of the earth, growing on (and up!) to provide food. 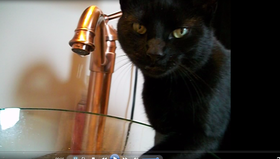 You’ll be hearing from us again…………..
Oh Sam my yard has whatever grows there: grass, dandelions, clover, and I don’t even try to control it, lol. It is nice around here with the woods and the field behind, which my neighbors keep up nicely and plant flowers in as well. Then we have our ramble-along garden, which is doing wonderful things. Veggie flowers everywhere! Eliza pulled the last of the spring onions this morning, and I put a few in my lunch. Now we have to wait for more blessings to be ready to eat, but everything is growing well. The Hopis are beginning their journey up their bamboo tee pee, which had to be a tee pee in their case. How fun this all is, and we’ll be eating well for a while. We’ll definitely have enough tomatoes to share, and maybe some other things too. Like tooo many cuke plants! The bamboo provides raw materials for support for all these wonderful things. Grow your garden well and enjoy the bounty too! Thanks Jackie. There will be more, for sure! I might wait till some beans reach the top of the trellis.